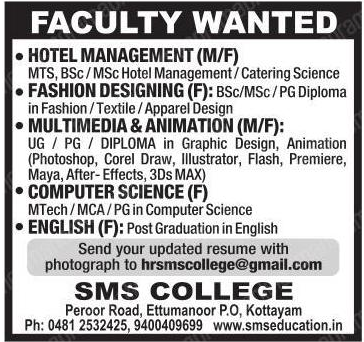 SMS College, Kottayam has advertised in Malayala Manorama newspaper for the recruitment of Faculty jobs vacancies. Interested and eligible job aspirants are requested to apply by earliest. Check out further more details below. About College: School of Management studies (SMS) established in 2002 for providing quality education to the young generation. SMS emerged a front runner in imparting quality education to the students.